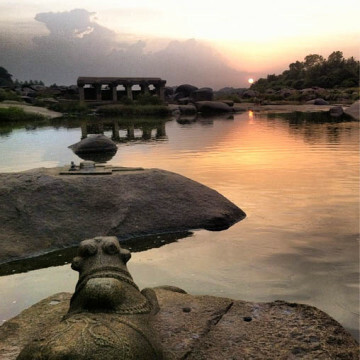 Hampi and surrounding villages have a strong association with the great Indian epic Ramayana. This is the area that is believed to be “Kishkinda” mentioned in the epic. Immerse yourself in a guided tour of Kishkinda led a by a local, who narrates fascinating incidents from Ramayana that occurred in Kishkinda. In fourth chapter or Kanda of Ramayana, Prince Rama comes to Kishkinda in search of his wife Sita who was abducted. Here Rama and his brother Lakshmana meet Hanuman, who leads them to Sugreeva, the ousted king of Kishkinda and brother of Vali. Sugreeva takes Rama to a nearby cave where he has hidden jewellery that Sita dropped as she was being abducted by Ravana, the king of Lanka. Rama kills Vali and restores the throne to Sugreeva, who in return agrees to help Rama find his wife Sita. Later Rama along with Sugreeva and his army of Vanaras wage war against Ravana of Lanka to free Sita. Here he meets Hanuman, the warrior monkey, and Sugreeva, who helps Rama find his wife. On this tour we will be visiting different locations in Kishkinda associated with the epic and narrate the relevant parts of the story. Starting 6.00 AM everyday of the week. The tour starts at the foothills of Anjaandri hill and ends at Chintamani. Start the day early just before sunrise by climbing up the Anjanadri hill. This hilltop is believed to be the birth place of Hanuman, one of the key characters in the Ramayana. Enjoy a simple south Indian breakfast at a local shop. After breakfast, we will walk through Hanumanahalli village and reach Rishimukh, the place where Prince Rama was believed to have first met Hanuman. We continue the day by visiting various places such as Kodandarama temple, Sugreeva’s cave and Malyavanta hill. We then cross the river Tunga by boat to finish the tour at the Chintamani temple in Anegundi. I had a great experience with Travspire. The trip was so well organised and everything we did was so much fun and different. I would highly recommend you try one of their many awesome activities!